Japan Display Inc. announced in the FPD International 2013 event a panel running at 1440×2560 resolution, obtaining a density of 543 ppi. This is the highest resolution ever seen in a TFT LCD panel. Japan Display also assured that they have optimized power consumption, a requirement for its possible implantation in smartphones. The Japanese company has not only fabricated one display, but two different ones, measuring 5.4 and 6.2 inch respectively. Both have the same incredible resolution, obtaining the corresponding densities of 543 and 472 ppi. These numbers make even the iPhone 4 with Retina screen look small, and raised some questions about their real utility. It seems obvious when we think about TVs that the higher the resolution, the better. In smartphones, however, this is not so evident. Increase the screen resolution is more demanding in energy and in power for the device, something important in a smartphone. Moreover, the higher resolution means that images and text appear clearer and sharper. In the end, however, is the human eye that had to see it. And if we are talking about a 6’’ screen, probably our human eyes won’t be able to appreciate the differences. That’s not the case of the phone, though. To run these amazing resolutions, the smartphone needs a powerful processor, such as a Qualcomm Snapdragon 800 or an Nvidia Tegra 4. 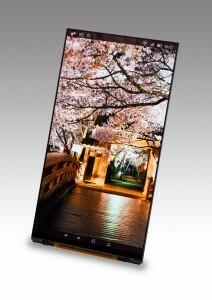 Japan Display has a close relation with Sony, so we can expect a Sony smartphone with this resolution for the next year. LG had already announced its own “Quad HD” panel last August with also a resolution of 2560 x 1440 (538 ppi). Everything suggests that the next generation of flagship smartphones will come with 1440 pixel resolution, and probably we will find a LG G-series Quad HD smartphone competing with the next Xperia. 2014 is going to be the year of 1440p resolution!